When security guards rob the bank (and the surveillance report goes to the robbers) The Fiji Times, 28 October 2008. The Interim Government currently, by force, takes roughly thirty percent of the people’s income or about $1,500 millions per year and decides how to spend it. The authority to tax the people by law, and to spend that revenue, is one of the most sacred responsibilities of an elected parliament. In normal times, the annual budget bill is presented to taxpayers through Parliament explaining tax revenues will be raised, how they will be spent through the different government departments. Only when the majority of the House of Representatives approves, does Government get the “legal authority” to tax the people and spend the money. In our Constitution, as elsewhere, an elected government’s failure to get the annual budget (the Appropriation Bill) approved in the House leads to automatic dissolution of parliament and fresh elections. This happened to Rabuka’s SVT in 1994, when the SVT’s Appropriations Bill was rejected. And to ensure that the elected Government does what it says it will do in the Annual Budget documents, our Constitution has a built-in safeguard, a surveillance camera- the Auditor General’s Office- which monitors in fine detail, all of Government’s actual revenues and expenditures, and annually reports to Parliament. Except that all these authorisations and safeguards have been thrown out the window by the military junta. The security guards charged with the duty of safeguarding the nation, have themselves been robbing the tax-payers of tens of millions. 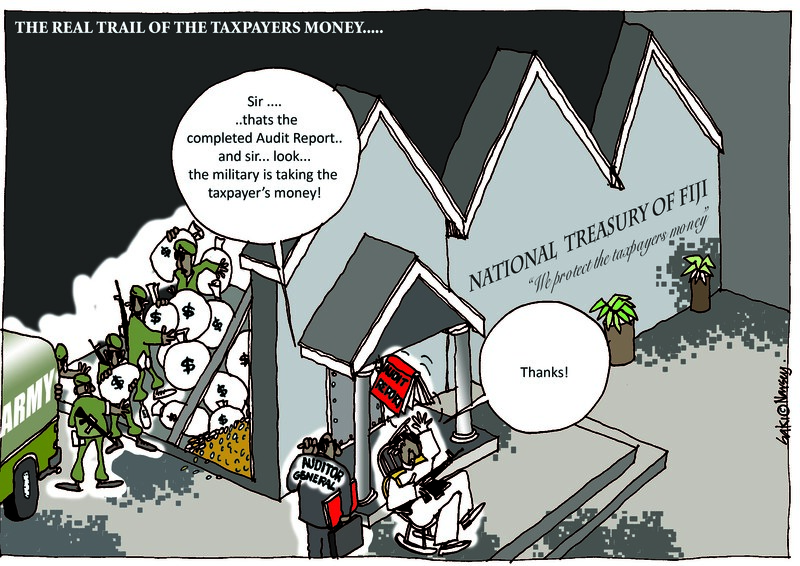 Worse still, they have put themselves in charge of the national treasury. And those given the responsibility of the detailed surveillance of government revenues and expenditure, are now sending their surveillance report to those robbing the tax payers. Since the December 2006 military coup, there is no elected Parliament. No taxpayers’ representatives are being asked to approve the national budget, nor can they reject it. Last year, Mahendra Chaudhry presented an illegal budget to the public, irresponsibly increasing the military’s budget by millions, while denying the country vital capital expenditure and poverty alleviation resources. What a bitter reversal of policies for an allegedly pro-poor political party. Soon again, a budget will be “presented” to the public with great media fanfare by the Interim Finance Minister, simultaneously the Commander of the Fiji Military Forces and the Prime Minister. Well, $1,500 millions of our people’s blood sweat and tears will again be taken from them and spent by this military junta, without the taxpayers’ approval. In 2006, the military which had only $76 million approved by Parliament, had actually spent $100 million, $24 million more than was approved. The military had effectively robbed tax-payers of $24 millions in 2006. Our government’s financial regulations require that any over-expenditure by any department is to be punished by surcharging the head of the department concerned. The Qarase Government tried to surcharge Bainimarama, the Commander of the Fiji Military Forces who simply refused to pay any fines- which in any case were a mere fraction of the total amounts stolen from tax-payers. And soon after (what a coincidence?) Bainimarama did the December 2006 coup, thereby removing the last elected government to approve any national budget. In 2007, the inside word is that the military over-expenditure has been around $30 millions, as Bainimarama splashed taxpayers’ money on the FMF, buying their support for the coup and his associated activities such as the NCBBF and the Charter charade. In 2008, with the military, police, and civil servants going all over the country to push the Charter agenda of Frank Bainimarama and John Samy, the over-expenditure is likely to be about the same, or more. In the last decade, poverty alleviation has to make do with a few miserly millions annually. As you read, Father Kevin Barr hustles away as Chairman of the Wages Councils vainly trying to get a few paltry extra millions for the poorest workers in the country. While Bainimarama’s military has swallowed up, in a brief three year period, almost a hundred million dollars more than was approved by the last elected Parliament. And it will continue to swallow up more. The irony now is that the security guards charged with the ultimate security of the country, have not only been robbing the country’s treasury and tax-payers, but have taken over the national bank itself. The FMF Commander, the leader of the robbing gang, has appointed himself the Minister of Finance in charge of the nation’s treasury. As Minister of Finance, with the help of John Samy and Company, he will now determine how much is to go to his own gang- the military. And what peanuts will go to the desperate poor, whose numbers and poverty has increased because of this 2006 coup. Without any permission from the taxpayers. And the irony goes further. Under our Constitution (Section 167), the surveillance unit on government spending is the Auditor General’s Office who must annually inspect and audit, and report to the taxpayers through Parliament on the public accounts of the State, the control of public money and public property of the State; and all transactions with or concerning the public money or public property of the State; to state whether they have been authorised by or pursuant to the Constitution or an Act of the Parliament; and whether expenditure has been applied to the purpose for which it was authorised. Well, the Auditor General has prepared his 2006 Report, no doubt including detailed comments on the over-expenditure by the military. But the military has removed the Parliament. So the Auditor General’s narrow interpretation of his legal responsibility is that all he has to do is report to the “Minister of Finance and to the President”. He won’t be reporting to the taxpayers ofFiji, whose taxes pay for his and other salaries in the Auditor General’s Office. He is also disregarding the brutal facts about crimes regarding public funds. The Interim Minister of Finance is the head of the Military responsible for removing the last lawfully elected government which provided the taxpayers’ authorisation of expenditure of their funds- the only standard to which the Auditor-General’s Office can currently assess current expenditures by this military junta. The Interim Finance Minister is also the head of the department which has been systematically guilty of robbing the tax-payers of almost a hundred millions in the last three years. And what accountability to taxpayers is the Auditor General achieving by giving his Audit Report to the “President”- who after being appointed by the military, purported to authorise the military’s removal of the government elected by the taxpayers, and indeed claimed to grant them immunity for all their crimes (including robbing the taxpayers?). The Auditor General, the head of the surveillance unit given the sacred responsibility of safeguarding the tax-payers funds from robbery, thinks that he is fulfilling his legal responsibilities, by giving his Audit Report to the Leader of the Gang doing the robbing, and to the “President” who has also already given immunity to the robbers for any crimes committed before or after the 2006 coup. Please Auditor General- give your report to the media so that you fulfill your real responsibility to the tax-payers, not to a Parliament gutted by the robbers of tax-payers funds. Soon, the Interim Minister of Finance will be solemnly reading his budget speech. The business community will already have been swarming around him getting their lollies, as they have done around every Minister of Finance, legal or illegal. The illegal budgets robbing the poor to pay for the military over-expenditures will also have critical inputs from John Samy, Francis Narayan and Company, recent retirees from the Asian Development Bank. What pathetic advertisements for the ADB’s regional advocacy of good governance, transparency and accountability! NGOs like the Citizens Constitutional Forum (Jone Dakuvula and Company), poverty alleviation advocates (like Kevin Barr and FCOSS) just three years ago would have been slamming the government for giving such huge amounts to the economically unproductive military while denying the poor. Today they are quiet even about the $100 millions illegally stolen by the military, effectively taking food and medicines from the mouths of the poor and those who are genuinely productive, like our hard-pressed nurses. Petero Mataca who co-chairs the NCBBF and preaches through the Charter about the urgent need for leaders to be honest, transparent and accountable, says nothing about the huge, criminal and immoral over-expenditures by his Co-Chair Frank Bainimarama, who has appointed himself Minister of Finance, while robbing the taxpayers. Like the three monkeys, our good citizens supporting the military government, the NCCBF, the Charter process, and the illegal electoral reform, see nothing, hear nothing and say nothing. A sure sign that that this nation has become a banana republic.